Darling you will always be Rarity to me. Yours and Discord's. He's always searching the forums. What is he searching for? Will he ever find it? Thanks to Twilight for this sig! 09:55 AM - Reese mentioned Rarity#1 in post Cardboard Box! This seems like Rarity#1's kind of thread. 02:51 PM - Reese mentioned Rarity#1 in post Give Rarity a face! 11:45 PM - Rise! mentioned Rarity#1 in post Where to Advertise/How did you find us? 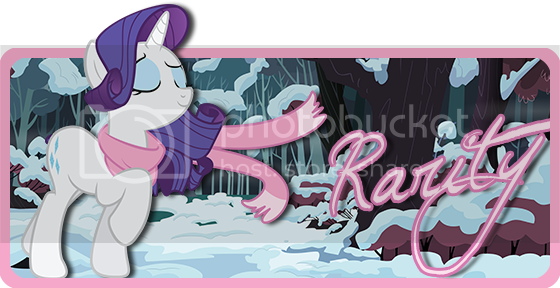 07:04 AM - Ryan mentioned Rarity#1 in post Staff Short Story Contest - Winners! 06:46 PM - Reese mentioned Rarity#1 in post Accent Test Challenge. 09:14 PM - Rarity#1 mentioned Twilicious in post Sexiest person on EQF Female voting. 02:09 PM - Rarity#1 quoted Applejack in post Name for the New RP Town! 05:55 PM - Rarity#1 quoted Reese in post Give Rarity a face!